I had the good fortune to receive an invitation to the formal launch of Saskatchewan Snow Beef at Benbie Holsteins west of Moose Jaw last weekend. 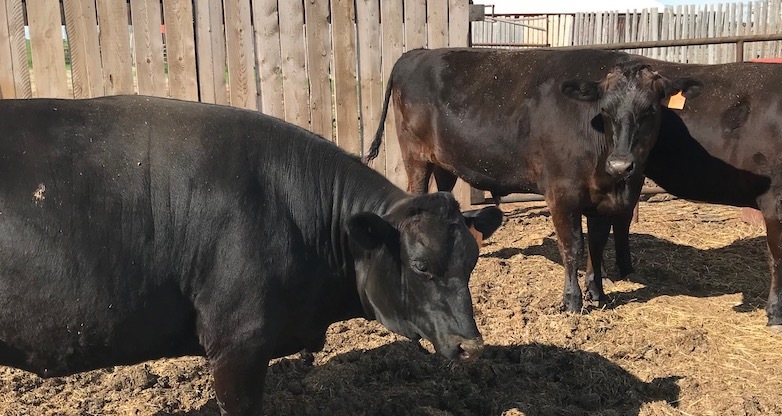 Saskatchewan Snow Beef is a new premium beef product created by breeding Wagyu cattle with Holsteins on Ian Crosbie’s farm. It turns out Wagyu and Holstein are well-matched breeds: they are both front-heavy with lighter back ends, slow growing, traditionally used for purposes other than beef production, and their meat is fantastically well-marbled. Crosbie was looking for options for his excess Holstein heifers and decided to give premium beef production a try. It turns out, if you’re very (very) patient and will let your Wagyu-Holstein crosses grow and fatten twice as long as your average Angus, the resulting beef is like nothing you’ve ever tasted before, unless perhaps you’re accustomed to enjoying Kobe beef, which is not a daily occurrence for most of us. Ian’s Canada Day BBQ, prepared by Chef Anthony McCarthy of the Saskatoon Club, featured several cuts of Snow Beef, including short ribs, skirt steak, flank steak, smoked brisket and hamburgers. He combined shredded short rib and sliced skirt steak in a soft taco with onion and aioli, a simple combination that allowed the beef to shine. That was my first taste of Saskatchewan Snow Beef, and it stopped me in my tracks. Full disclosure, I grew up on a mixed farm that focused on Black Angus cattle and grain. Black Angus are generally considered a premium beef breed for their easy birthing, fast growth, and excellent marbling. I have eaten happy, farm-raised cattle of excellent heritage my entire life. I tend to not even bother with beef in restaurants because I find it disappointing. And yet here I was, with this Snow Beef taco in my hand, marveling at the rich flavour, amazing juiciness, and a texture that I’ve never really experienced in beef before. The skirt steak was firm to bite, but not tough at all. It just yielded beneath my teeth and flooded my mouth with juicy, beefy flavour. While the entire meal was memorable, with multiple salads, such as a shitake mushroom and corn salad that complemented the meat perfectly, and a caprese-style salad featuring Coteau Hills Creamery feta cheese, another gem made in Moose Jaw, the beef was definitely the highlight, as it should be. Chef Anthony let the quality of the product shine through, using only salt and pepper in both the hamburgers and on the flank steak. And that flank steak. It had the same qualities as the skirt steak, that indescribable texture that I didn’t know beef could have, but now I’ll be holding that memory up against every bite of beef I take from now on, because that’s what it should always taste and feel like. Even the brisket, which I find is often technically ‘tender’ but still a bit stringy, held together like a beautiful, tender roast, and melted in my mouth. My husband leaned over to me in the midst of the meal and whispered, “What are we going to say to your dad when we break up with his beef?” I’ll hold off on planning that conversation for now, because Saskatchewan Snow Beef will only be sold to restaurants at first. But if it is ever available for retail, it may just be the start of a family feud. Thanks again to Ian and his family for the invitation to sample Saskatchewan Snow Beef on its inaugural day. I will be watching this product with great interest, and if you see me at the restaurants that are serving Saskatchewan Snow Beef, you’ll know why. But don’t tell my dad. © 2019 Noelle Chorney All rights reserved.